Fresh and inviting, this cozy chair corner is waiting for you! Find a seat in the amazing Womb Chair, a favorite for reading or just lounging around on a free afternoon. Bright whites and beautiful greens make this space extra appealing. Let's stay home and shop the look! 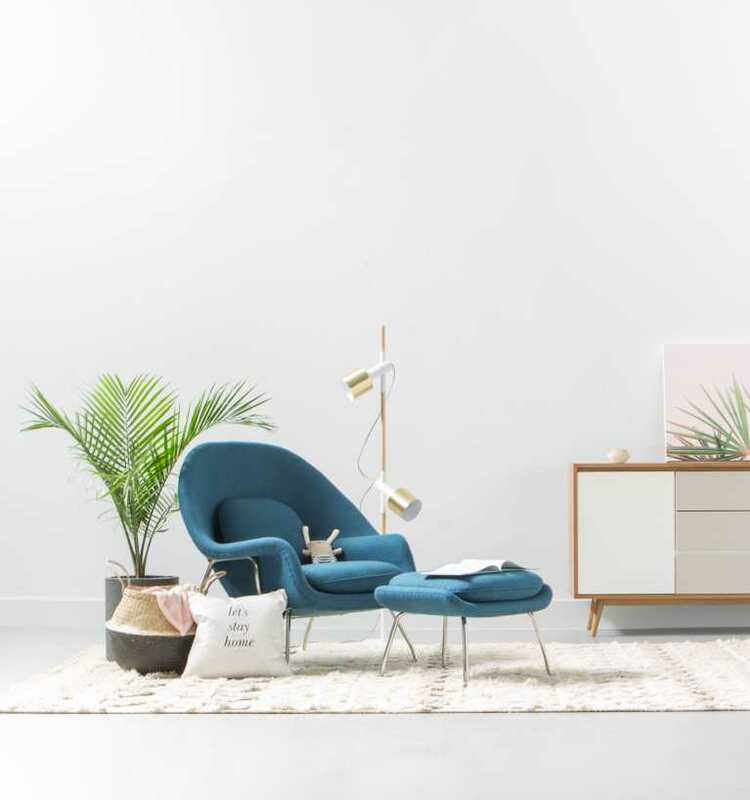 Is there a lounge chair more perfect for an afternoon at home? Designed to mimic the comfort of a mother's womb, the Womb Chair is the epitome of cozy. Enjoy this brilliant shade of Twilight for a touch of character. A modern lamp with a touch of spectacle, Jasper is crafted from matte metal, wood and muted copper. The cylindrical shape of the shade adds a unique touch that is both humbly outstanding and functionally useful. This modern piece features a touch of neutral color that is framed by luxurious wood veneer. Durable and eye-catching, this Danish sideboard will complete your quaint interiors with modern style. The lighter hue of this wood feels calm, ideal for those quiet afternoons. The Rubberwood Candle Holder is a playful piece that can also be used in groups like decorative building blocks. Cushions add character and coziness to bedrooms or living room spaces. Our premium waterfowl feather filled cushions are created soft and made for staying home. A truly characteristic rug with hand-knotted detailing, Ezra is inspired by a clash of traditional and contemporary design featuring geometric patterns and layered textures. Shop the look for your own cozy corner. Keep exploring for more shoppable spaces.